The three One-Day International matches scheduled for March 2017 will be preceded by two warm up matches at Warner Park in St. Kitts. The England team which arrived in St. Kitts and Nevis on Wednesday, Feb. 22 will play its first warm-up match on Saturday, Feb. 25 and Monday, Feb. 27. They will then take on the West Indies twice in Antigua and once in Barbados. According to National Selector James Whitaker, the England Squad has remained unchanged for the West Indies ODI tour because it was important for them to keep faith with the squad that competed during the recent tour of India which they lost 2 – 1. 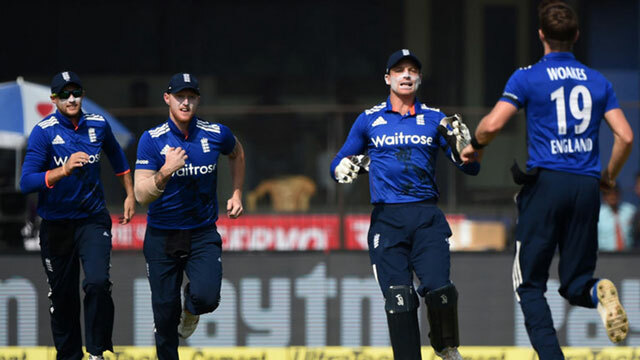 “We felt it was important to keep faith with the squad that competed during the recent tour of India. The current group of players are making excellent progress under the captaincy of Eoin Morgan and head coach Trevor Bayliss and the tour of the Caribbean will enable the team to test themselves in different conditions against a competitive side in the West Indies,” Whitaker stated. Opener Alex Hales is the only member of the 15-man squad who has not been retained for the West Indies tour after suffering from a fractured right hand during the recent ODI series in India which forced him to fly home early. Mr. Hales has been told he does not require surgery after meeting with a surgeon this week and should be fit to take on Ireland in two ODIs at the start of May. Hales will thus continue his recovery in England, and with no replacement named, England will take the same 14 to the Caribbean that finished the finished the series in India. Sam Billings who deputized for Hales in last week’s third ODI in Kolkata is set to partner Alex Roy at the top of the order while selectors have decided against a one-day recall for Stuart Broad. The complete 14-man squad consist of Moeen Ali, Jonathan Bairstow, Jake Ball, Sam Billings, Jos Buttler, Liam Dawson, Eoin Morgan, Liam Plunkett, Adil Rashid, Joe Root, Jason Roy, Ben Stokes, David Willey and Chris Woakes. Meanwhile the West Indies 15-man training squad under the guidance of new Head Coach Stuart Law consist of Jason Holder (Captain), Devendra Bishoo, Carlos Brathwaite, Kraigg Brathwaite, Jonathan Carter, Miguel Cummins, Shane Dowrich, Shannon Gabriel, Shai Hope, Alzarri Joseph, Evin Lewis, Jason Mohammed, Ashley Nurse, Kieran Powell and Rovman Powell. The first ODI match will be held in Antigua on Friday, March 3 at the Sir Vivian Richards Cricket Ground the second also in Antigua on Sunday, March 5, and the third in Barbados on Thursday, March 9 at Kensington Oval.